Is it time to soup this day up a bit? Not to be too negative but the website doesn't really scream inclusiveness. 22 more years until our Bicentenary! We better build a 400 metre tower by then to help celebrate! Melbourne was founded on 30 August 1835 by the settlers who sailed from Van Diemen’s Land (Tasmania) on board the schooner Enterprize. They landed on the north bank of the Yarra River, close to where Customs House stands today and the place now known as Enterprize Park. The Melbourne Day Committee was established to help correct the record about the founding of Melbourne. Join Melbourne's 179th birthday celebrations from 20 to 31 August. We're celebrating with an all-ages free concert at Federation Square, a spectacular Docklands regatta, an Urban Explorer tour around town, a flag-raising ceremony at Enterprize Park, special offers, discounted tours, a corporate lunch — plus gifts to you from a range of cafés, restaurants and retailers in our Cheers! Melbourne event. 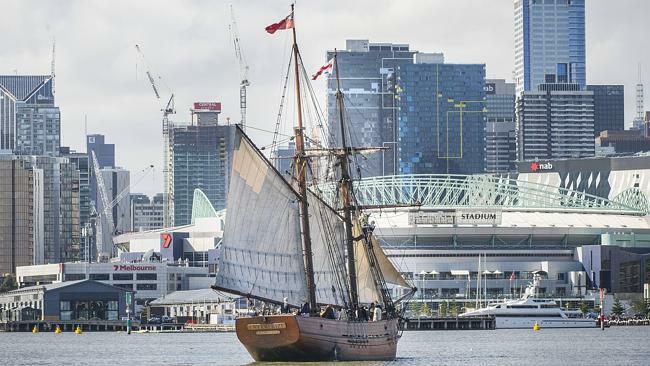 MELBOURNE made a splash as it took to the water to celebrate its 180th birthday in style. Rivalling anything Sydney could offer, the world’s most liveable city celebrated Melbourne Day with a giant waterside party. Today marks 180 years to the day when the Enterprize ship carrying the first European settlers sailed into the Yarra from Hobart. One hundred and eighty years ago the tall ship Enterprize sailed up the Yarra River. Landing a party of five men, one woman, a cat, stores and livestock on the northern bank, a fledgling settlement was begun. As the town rapidly grew, the motto Vires acquirit eundo – ‘we gather strength as we go’ – was chosen for its people. Borne out over the years, the story of Melbourne’s development has been one of rapid growth, great progress and buoyant optimism. Gold rushes, building booms, industry, innovation and migration have defined Melbourne’s history, and created the modern metropolis we know today. Now a vibrant hub of style, sport, arts and dining, Melbourne is the cultural heart of our nation, and one of the great cities of the world. As you celebrate Melbourne’s 180th anniversary, I offer my warmest congratulations to all its citizens. It's the birthday concert of the year. • Ross Wilson: Eagle Rock plus other Daddy Cool and Mondo Rock classics. • Lisa Edwards with Michael Cristiano: John Farnham's smash You're the Voice. • Get your free birthday cupcake (while they last)! • Cutting of a giant birthday cake, made by Ferguson Plarre Bakehouses. • MC Craig 'Huggy' Huggins from GOLD104 FM. Feel the pride at the official flag-raising ceremony, Enterprize Park. Join Lord Mayor Robert Doyle, city councillors, the 2017 Junior Lord Mayor, civic leaders and special guests as we salute the flag at 11am. The event will be live on radio 3AW, with the station holding a special Melbourne Day outside broadcast of the Neil Mitchell Morning program from 8.30am to noon. • Welcome to Country by highly acclaimed Aboriginal artist Stan "Yarramunua" Dryden. • Hear the big sound of much-loved Victoria Police Pipe Band. • Meet Melbourne's "first settlers" - the Enterprize re-enactment crew in period costume, including Gilbert, the Tassie tabby, our city's first cat. • Hear our roving town crier in full voice. This is a free public event, school groups and families welcome. Bring the whole flock!